Jessica Compton’s family of four would have no income if she didn’t donate plasma twice a week at her local donation center in Tennessee. Modonna Harris and her teenage daughter, Brianna, in Chicago, often have no food but spoiled milk on weekends. After two decades of brilliant research on American poverty, Kathryn Edin noticed something she hadn’t seen before — households surviving on virtually no cash income. Edin teamed with Luke Shaefer, an expert on calculating incomes of the poor, to discover that the number of American families living on $2.00 per person, per day, has skyrocketed to one and a half million households, including about three million children. Where do these families live? How did they get so desperately poor? Through this book’s eye-opening analysis and many compelling profiles, moving and startling answers emerge. 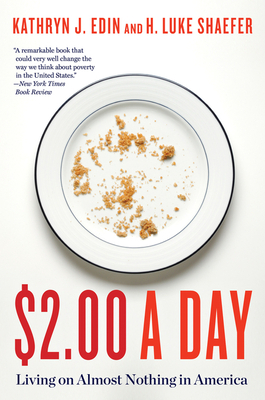 $2.00 a Day delivers new evidence and new ideas to our national debate on income inequality. KATHRYN J. EDIN is one of the nation’s leading poverty researchers, recognized for using both quantitative research and direct, in-depth observation to illuminate key mysteries about people living in poverty: “In a field of poverty experts who rarely meet the poor, Edin usefully defies convention” (New York Times). Her books include Promises I Can't Keep: Why Poor Women Put Motherhood Before Marriage and Doing the Best I Can: Fatherhood in the Inner City. Edin is the Bloomberg Distinguished Professor of Sociology and Public Health at Johns Hopkins University. H. LUKE SHAEFER is an associate professor at the University of Michigan School of Social Work and Gerald R. Ford School of Public Policy, and a research affiliate at the National Poverty Center.